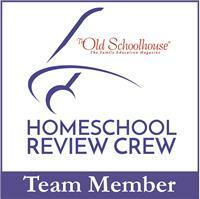 I grew up with birthdays celebrated with joie de vivre, handmade invitations, and homecooked food. And these parties always had a theme. My aunts and uncles all pitched in to make the invitations and décor, and games and entertainment. As an adult, I loved themed get-togethers, even if it was just friends coming over. We’d have a P Party for example, where everything was potluck, and the food had to start with the letter p, and we did it by the pool. I think my friends learned their letter sounds that way. 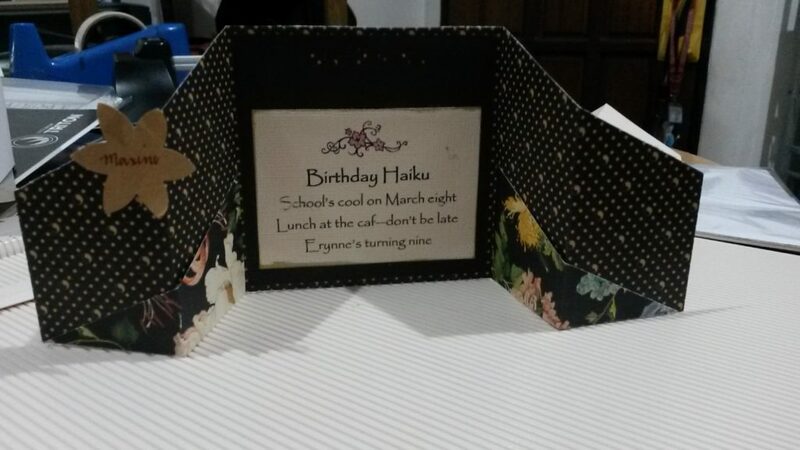 The Birthday Haiku. We counted syllables for several possible variations! The card base for the invitations was made from the elusive Graphic 45 Song Bird card stack. Needless to say, I was thrilled to have my own kids. At least two themed parties a year! Sadly, the kids decided that they would rather celebrate by going out and doing something else. Breeze, who hates all that hullaballoo, decided by her fifth birthday to do away with parties. Raine celebrated her ninth birthday in school last year—and that was the last time I had a DIY themed party for any of the girls *cue the sound of my heart breaking*. There is such joy (for me) in preparing for a loved one’s birthday celebration though. So as we approach Breeze’s seventh, allow me to reminisce my last DIY. 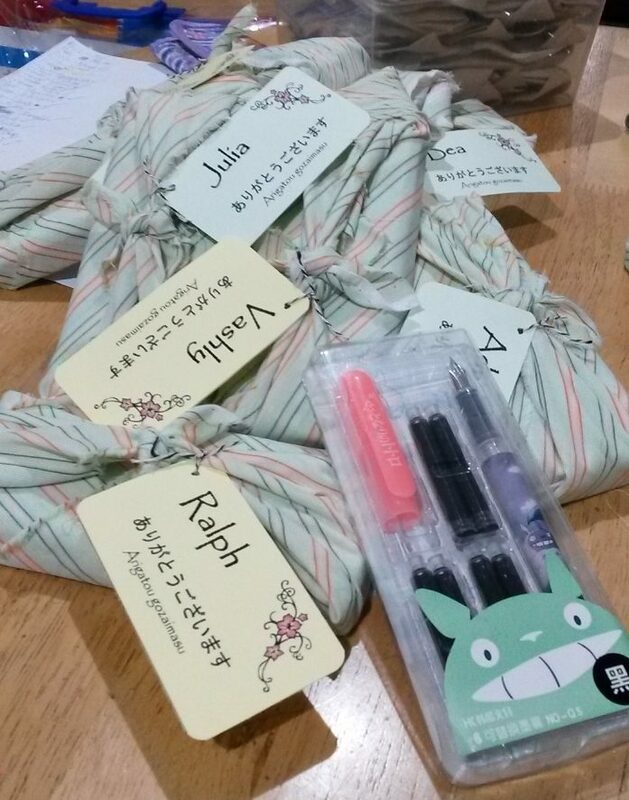 The main giveaway: Totoro fountain pens, wrapped in cloth, furoshiki-style. I printed out the thank you cards, with the same cherry blossom element I used in the invitation. The kids were into Totoro last year, and loved all things Japanese. Raine’s celebration wasn’t actually a full party, but just lunch in school with her classmates. I decided that a school lunch didn’t have to be boring, so I put a Japanese spin to it. I wrote a haiku with all the pertinent details in it, made some sort of gatefold card base, and stuck on the poem, and voila—invitation. I love loot bags at parties, and I always try to make ours useful. 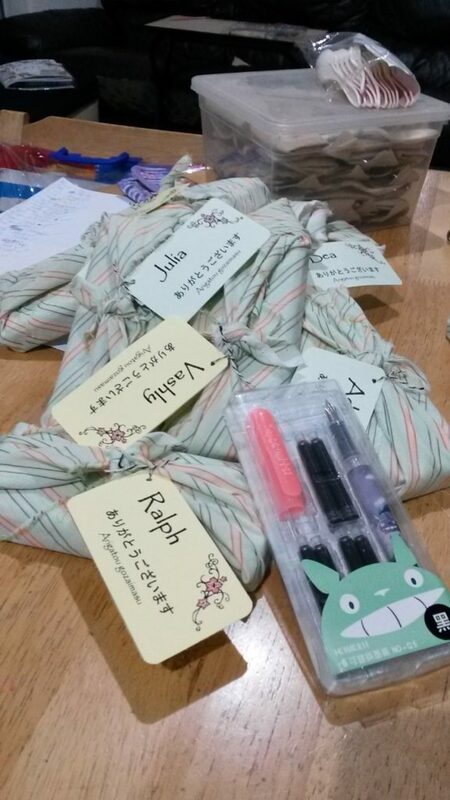 I found inexpensive Totoro fountain pens, and wrapped those furoshiki-style, using leftover cloth my sister had. 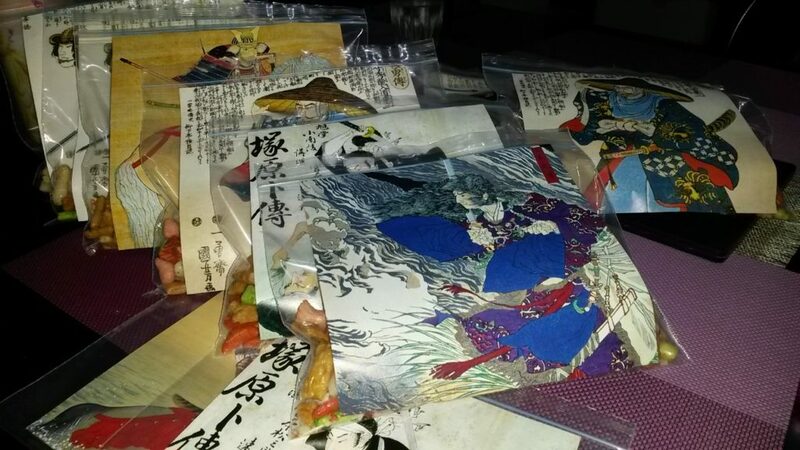 Then I measured out Japanese cracker snacks into quarter zip lock bags, and glued on lovely Japanese samurai origami paper. And the main thing—the lunch. We decided to go for a Bento-ish vibe. Finally, the cake. 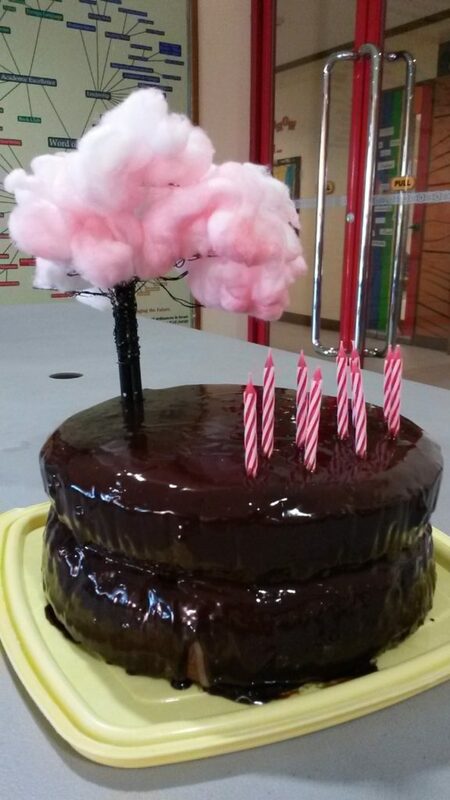 I just baked my usual Ugly Cake—chocolate cake with ganache—and my sister made a cherry blossom tree from jewelry wire and dyed cotton balls. 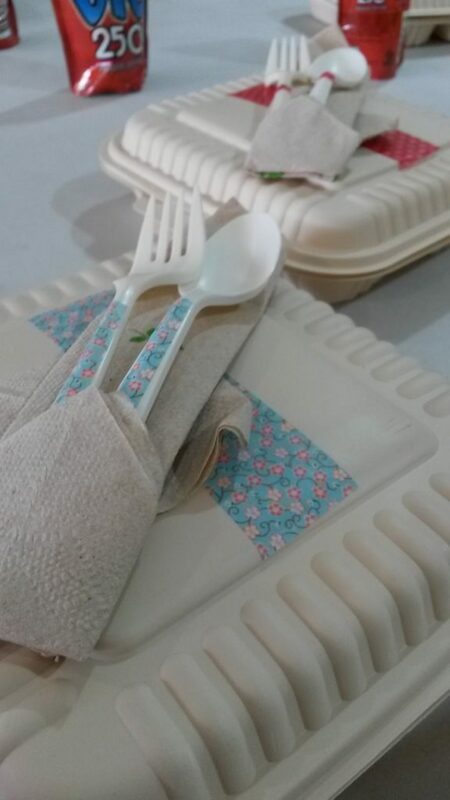 Just to dress up the slightly sad Bento boxes, we stuck washi tape on the disposable packs and utensils, which were placed in a lovely origami-folded paper napkin. 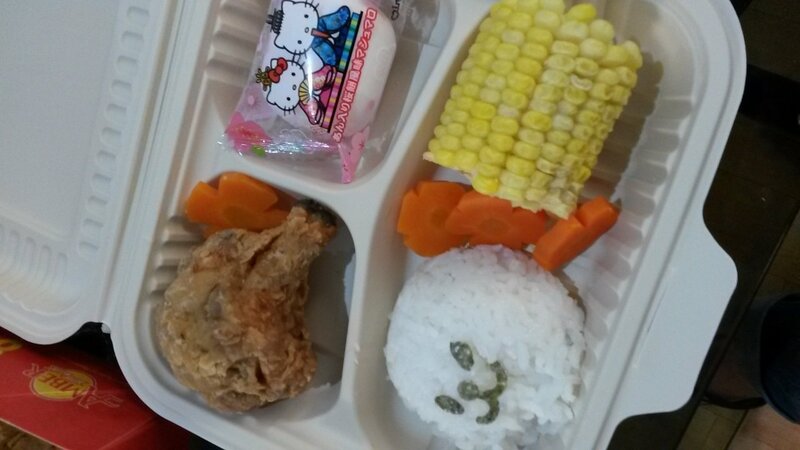 As Bento as I can be: sort of shaped carrots, some creature face on rice, and a legit Hello Kitty Japanese treat. The rather haphazard Ugly Cake (hence the name) with Raine's candles under the cherry blossom tree. I think the hardest thing for this party was hunting down the Japanese-themed papers I used. 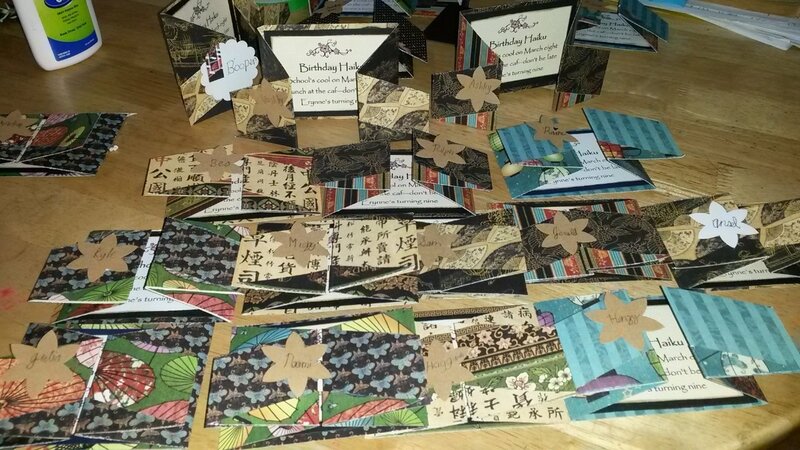 Fortunately, I bought the samurai origami paper a year ago, even before we decided on a Japanese theme. Because you know. Samurai origami paper is something that always comes in handy. The Japanese snacks, I bought about two months before Raine’s birthday, and we succumbed and ate one whole pack, and therefore had less to put in the goody bags. The kids actually swapped Samurai Snacks, based on which one was "cooler." Still, it was fun overall. Raine enjoyed it, and so did her classmates. And that’s what really matters. Wow, I am so impressed! This is totally out of my zone. 🙂 Nice job, I bet your kids will look back with warm feelings about these! That’s a lot more work on a party than I would do, but I love it!! Especially impressed by the decorated bento boxes and utensils! Maybe as your kids get older they will want the themed parties, right?